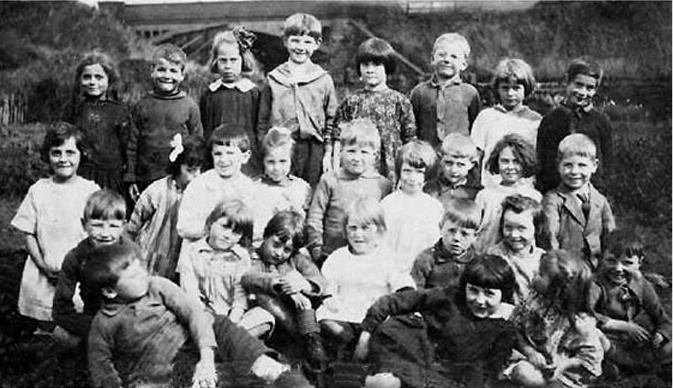 The photo id for this photograph is 96, in the Schools album. 1920s - Pictured (left to right) are (back row) not known, Herbert Thorpe, Mary Turner, Eddy Trickett, Lily Williams, Joey Fowler, not knowm and Harry Cookson. (Middle row) Jenny Barnes, not known, not known, not known, not known, Irene Pyott, not known, Nellie Kirk and not known. (Front row) Alan Waterhouse, Phylis Dawson, not known, Flori Moss, not known and Ethel Hill. Sat on the ground - not known.